Eigenschaften: Die Schuhe fallen sehr schmal aus, bitte eine Nummer größer bestellen als normal. Kompressionsmanschette für eine nahtlose Passform, die sich anfühlt wie eine "zweite Haut"
Der Schuh ist eher schmal im Fußbett. Wir empfehlen bis zu 1 Nummern größer den Schuh auszuwählen. 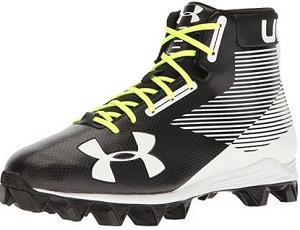 Make the defense cry uncle as you take down the opposition in the Under Armour® UA Highlight RM football cleat. 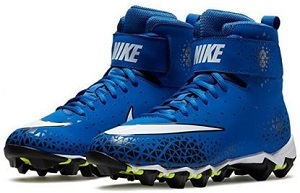 Synthetic and mesh upper materials. CLUTCHFIT™ upper technology provides protection and a custom fit. Lace-up closure. Extended eyerow cutouts allows easy entry and enhanced flexibility. 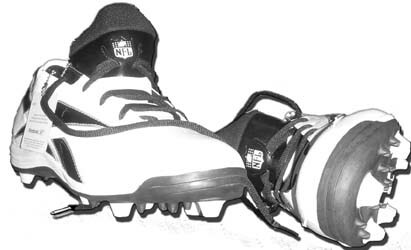 Padded tongue and collar. Breathable fabric lining offers a great in-shoe feel. Molded foam insole. Die-cut EVA midsole supplies unmatched comfort and cushioning. 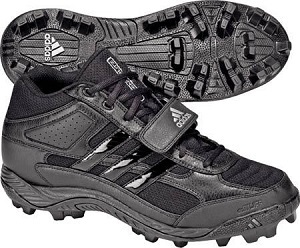 Ruggedly lugged rubber outsole promotes optimal grip and speed. light, super-streamlined, fully locked-in speed. in the forefoot helps to limit toe hyperextension and provide optimal range of motion and traction. 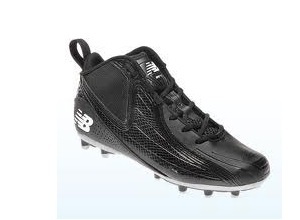 synthetic leather upper and built for speed. Inside, a molded EVA insole shapes to the foot and provides extra comfort. The TPU Fly plate is designed for lightweight traction and durability. Wt. 9.4 oz. Upper: Mesh nylon with synthetic leather overlays. 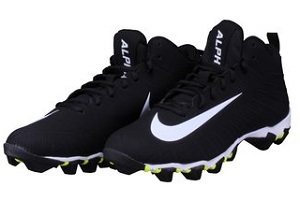 Padded mesh tongue and ankle collar. Inlay: EVA lining provides comfort while reducing cleat pressure. and add speed to every step. 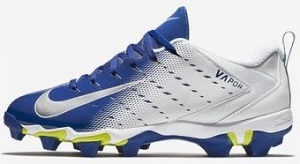 Upper is Leather. 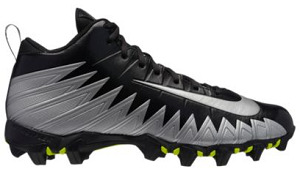 Three-quarter cut provides excellent stability for speed players requiring more support. Mesh nylon combines light weight and breathability. 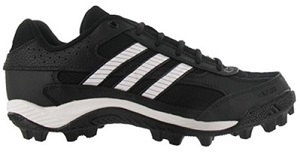 Synthetic leather upper for lightweight and durability. Lining is Textile. Inlay is EVA insole for comfort. Midsole is Injected EVA for long-term lightweight cushioning. Outsole is Rubber outsole for durability and comfort. rapid acceleration and lightning-quick changes of direction. Full-length foam cushions your foot for comfort throughout the game. 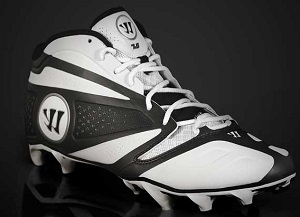 ensures superior traction, flexibility and speed to make game changing plays. 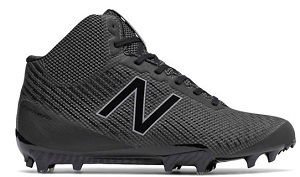 lightweight performance and fit while a full-length Phylon midsole supplies superior cushioning and responsive comfort all game long. 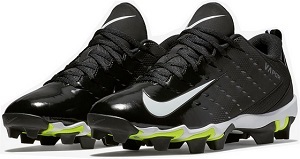 The Nike® Vapor Shark football cleat has a shark rubber outsole with Nike® fast-flex that provides unmatched performance, traction and speed on the field. 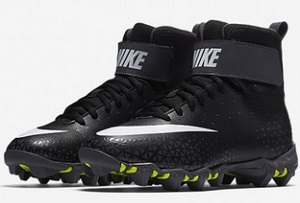 Synthetic, Strategically placed cleats move with the Nike Fast Flex technology. und Strapazierfähigkeit. Ultraleichte Flywire-Fasern für festen Halt von der Ferse bis zum Mittelfuß. widerstandsfähige Dämpfung und Halt. Mesh-Innenschuh umgibt den Fuß und sorgt für Atmungsaktivität. perform at top speed during practice and play. Full-length Phylon midsole for responsive cushioning. 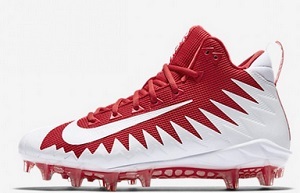 Aggressive Shark rubber outsole with Nike fast-flex for natural performance and speed. 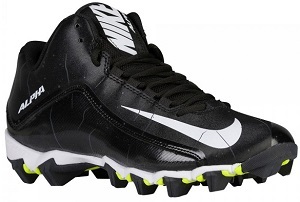 while aggressive rubber cleats deliver the traction you need to accelerate and change direction quickly. der Menace Shark bietet dir einen spitzen Halt. Der Shark sticht durch sein herausragendes Design hervor. Wir empfehlen eine Halbe Nummer Größer den Schuh zu bestellen. Der Schuh fällt bis zu einer Nummer kleiner aus. Schuhe empfehlen wir mit einer Daumen Breite Luft vom Zeht bis zur Schuhspitze zu tragen. Geeignet für Rasen und Kunstrasen. Schuhe nicht auf Metalrost oder ähnlichem abklopfen. 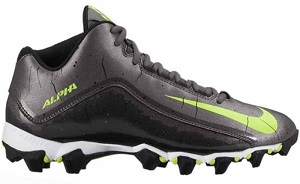 these cleats feature 3-sided studs for added quickness during multidirectional cuts and changes of direction. 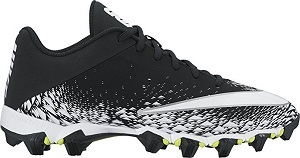 Mesh and synthetic skins on the upper provide durability and breathability while keeping your feet comfortable from the first snap to the last. 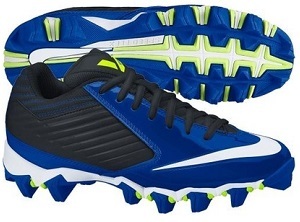 Flywire tech on the upper keeps your foot locked down comfortably. 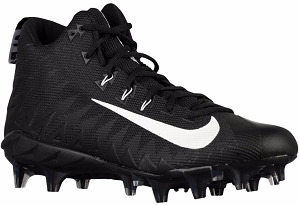 Mesh and synthetic skins on upper are durable and breathable all game long. 5/8 collar add support and comfort. 3/4-length Phylon midsole wedge gives you premium cushioning. 3-sided studs are built specifically for quick, multidirectional cuts, stops, and accelerations. Wt 15.0 oz. Synthetic-and-mesh.Flywire technology provides a locked-down fit. 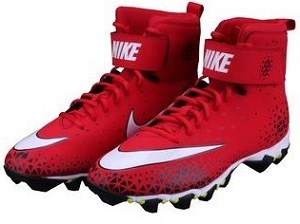 Der neue Nike Force Savage Elite TD, ist die Antwort für alle die Hohe Schuhe suchen und oder eine zusätzlichen Schutz. Geeignet für jede Position - empfehlung vom Hersteller für breite Füsse. Der Schuh fällt bis zu einer Nummer kleiner aus und der Eingang ist schmal. Geeignet für Rasen und Kunstrasen. TPU Sohle die den Schuh sehr leicht halten. Schuhe nicht auf Metallrost oder ähnlichem abklopfen. Die Chrome Sohle ist lediglich ein Klebeschicht welche sich umgehend lösen wird. Die Optische Veränderung ist kein Herstellerfehler. Sie erwerben diesen Artikel als Sondermodell. Der neue Nike Force Savage Elite PRO, ist die Antwort für alle die Hohe Schuhe suchen und oder eine zusätzlichen Schutz. Schuhe empfehlen wir mit einer Daumen Breite Luft vom Zeh bis zur Schuhspitze zu tragen. Geeignet für Rasen. TPU Sohle die den Schuh sehr leicht halten. 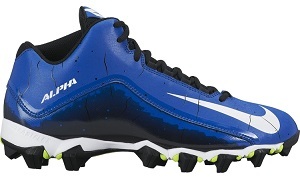 Mid cut football cleat built for speed and support on the field. Molded cleats. 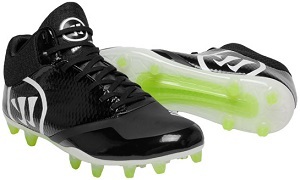 Lightweight outsole and snug fit for the fastest players on the field. LIGHTNING DRY® lining wicks moisture away to help keep your feet dry and comfortable. Lightweight traction built for speed. 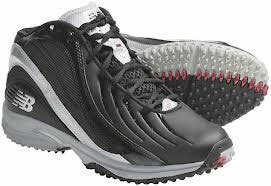 Synthetic upper provides lightweight comfort and durability. Weight: 350 g.